When you think of your favorite lake activities, what comes to mind? If you said fishing, you’re in luck! Big Bear Lake is known for its fishing opportunities, and many cast their lines into its waters every day. For a great experience, we recommend charter fishing at Big Bear Lake. These companies are experts in the area, so they’ll give you tips and tricks about how to catch fish! Are you planning a trip to Big Bear, California? You’ll need an expert in the area! Our complimentary Vacation Guide has all the information you need for the trip of a lifetime. Whether you’re looking for charter fishing at Big Bear Lake or the best restaurants in the area, you’ll find them in this free guide. It will save you tons of time researching so you can spend more time on what’s important: making memories. When you go on a trip with Big Bear Charter Fishing, their number one goal is to make sure you have a good time. All fishing gear will be provided, so the only thing you’ll have to bring is your sense of adventure. A licensed, professional guide will take you out on the lake for 3 hours on either a pontoon boat or tournament style bass boat depending on what type of fish you are looking to catch. Whether you are an expert fisherman or just beginning, their expert guides will help as little or much as you would like. Fish Big Bear Charter Services will take you out on the lake in their 22’ pontoon boat. The craft is outfitted with fish finding electronics to help locate your catch! Choose to either catch and release or catch and keep. If you decide to keep your fish, this charter will also clean them for you and recommend some recipes so you can cook them in your Big Bear Lakefront Cabin! If you choose to stay at a lakefront cabin with a dock, they might even be able to pick you up there. Book a time, then cast your line with this charter fishing at Big Bear Lake. Cantrell Fishing Guide Services is made up of seasoned fishing experts that know the ins and outs of Big Bear Lake. Each charter has a 2-hour minimum, but you can choose how long you’d like to be out on the water for. They’ll pick you up at your private dock, or you can meet them at the marina. If you don’t have a California fishing license yet, you can easily get one at the marina! Pack some drinks and snacks, then you’re good to go. 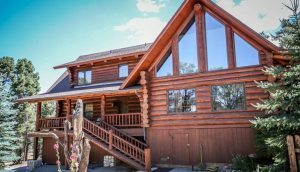 It’s time to book your getaway at Big Bear Lakefront Cabins! Our properties are located all across town so you can choose based on size and location. If you like being out on the lake, our lakefront options might be the best for you. You’ll love waking up to views of the sparkling water or looking out over the lake as you take a relaxing soak in your private hot tub. Browse our rentals, then book your stay!